Plot: The corporate security service and the Colonial Authority security service are, legally, very different animals. In this case “called up” means elevated – in responsibility if not authority or position – as opposed to, say… transferred from the reserves to active duty. If ATC were an OVA then the Peregrine’s tail would roughly match Grij’s horns in a quick fade or a well-timed jump cut. Said cut would also drop the vox/comms effect on James’ voice; on the commentary track I’d probably say something about narrative efficiency. Though an OVA would probably have some sort of budget for people who aren’t me to build environments so the whole scene might play out a little more Return of the Jedi. 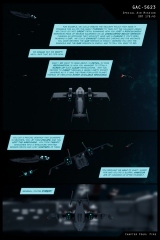 Art: These are the first shots of the Sabrosa sick bay, and the first rendered depth of field shots in the series. Previous blurred backgrounds were processed in post. While I did some touch-up work, the backgrounds of panels one, three, and four (oxford comma!) all came out of the software pretty much exactly how you see them. They also took forever to do so, which isn’t that big of a deal at this point, honestly – all of the sickbay shots have been rendered. The next time I fire up the software it’ll be for the Daedalus, which is where the majority of the chapter takes place. 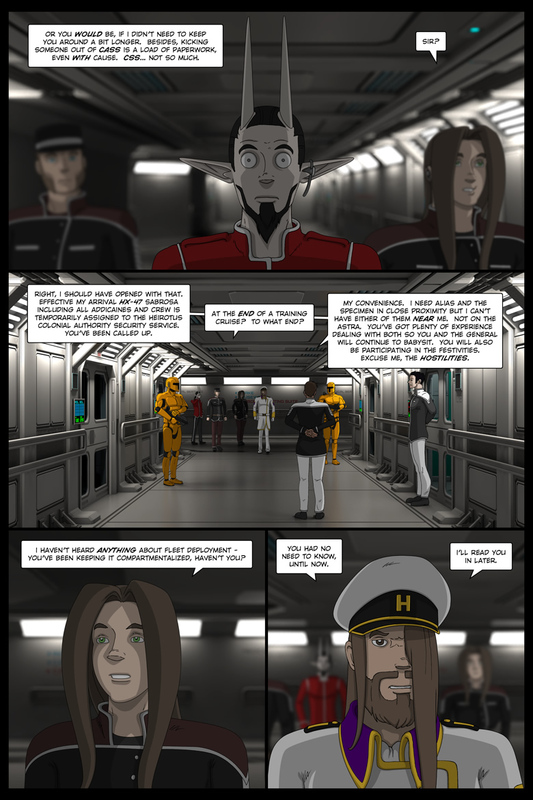 Note the reflections in panel two – that effect makes excellent use out of the reference models, which in turn make excellent use of their respective characters color palettes, allowing simulated photons to bounce correctly and allowing for “proper” blurred reflections – a thing I avoided in all previous environments for maintenance reasons; a thing I’ve embraced the hell out of in this scene for bling reasons. This is the first full appearance of the Sabrosa medical officer’s uniform, briefly indicated in Air -29-. 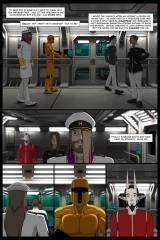 This page also marks Major Wakeman’s first appearance since January 12th, 2005, and Captain Andreissen’s first appearance since October 20, 2004 (chronological) or January 12th, 2005 (production, as a reflection). James has cleaned up for the occasion – I have no qualms admitting that his uniform has a loud, proud design heritage. It’s also appropriately color keyed – any other instances of this uniform probably won’t have a purple interior. The exoskeletons worn by James’ security detail are the oldest designs in the scene – they originated in 1995 or 1996 and while the details have been refined a bit over the years they’ve made it to their first comic appearance almost unchanged. Their weaponry – which is never seen in detail – is a much newer design, derived from the HK G11 and the Bizon. Their reference models use a metal shader, which presents a completely different light-matching challenge than the basic shader I use for all other reference models. It’s been seven weeks since Fire -1- was posted. This comes close to the record gap between the original version of Air -30- and Air -31-. While that gap was technically a bit longer it was also, largely, a working gap – I built a font, did a partial script rewrite, and redid most of Air -30- between the two pages. Sure I was depressed to the point of non-functionality for several weeks, but stuff was getting done. This “break” was a bit different. Between first week of June and the fourth of July, ATC was not a positive experience. It did not exist as a thing that was in progress. If my present disposition can be compared to the ebullient public personas of other comic creators then it still isn’t a positive experience – the difference is that now, after some time “away,” I can hold the idea of working on the comic in my head for a measurable length of time without dissolving into a poisonous morass of neuroses. Sisyphus, back at the boulder. Thirty eight pages of boulder. Thirty seven, actually, as I finished shading the next page a few hours after I finished this one. I may post that page next week, I may post it later this week – I haven’t decided yet. I’d like to get the line art for pages four and five in the pipe first. If I want to get the chapter done this year – I’m not sure I still want that, but if I do – I’ll have to double up. Maybe even triple up. I’m not even sure if that’s possible, mind you – the ability to just get stuff done with the comic is a place I haven’t been in quite awhile and I have no idea how long this current state of affairs will last. 112 queries in 0.816 seconds.